Slightly off topic, I know. I've been interested in googlemap mash-ups for the longest and just learned that the Buffalo Police Dept. is now reporting crimes in the Queen City using this interface. After clicking through and exploring the site and its seemless functionality, please let me know what you think of this development. Thanks. I noticed the demolition action here a couple weeks ago and stopped by the other day. 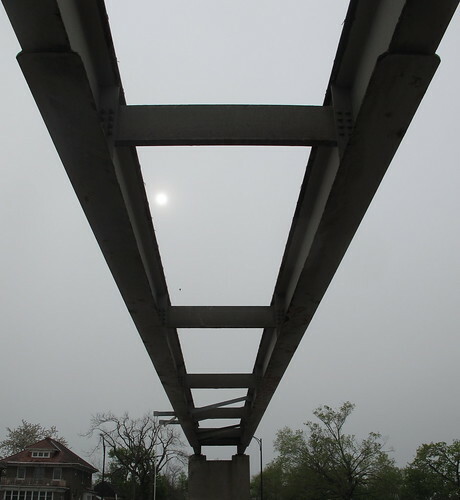 According to Masten District Councilman Demone Smith's office the 46 year old pedestrian bridge connecting a once vibrant neighborhood just south of Northland Street will be rebuilt in the coming months. No news yet as to the project's cost. The other two pedestrian crossings along the '33' connect neighborhoods that are still split. I posted about the first one, connecting Grape and Cherry Streets - see, Crossing the '33' - Part I - in January '07 and the equally bisected neighborhood near High and Gray Streets - Crossing the '33' - Part II - in May '07. In the past few months I've become a big fan of Historic Aerials, sort of works like googlemaps. When you drill down you'll notice that the '33' was completed in stages. In the 1958 map - centered on the Science Museum - you'll see that the destruction construction had already begun, closer to downtown. By 1966 most of the '33' was completed between the 198-hourglass and downtown. 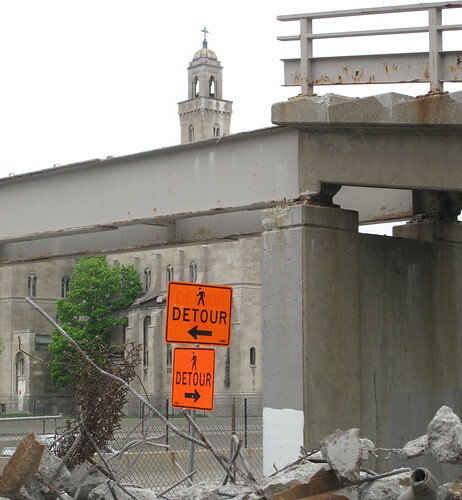 The section between Best and Ferry Streets was still at-grade. Using one of the site's embedded tools take a moment to compare that 1958 moment with today's existing reality. Staggering. While shooting what remains of the pedestrian bridge earlier this week, I noticed a number of houses on the east side of Humboldt Parkway that have been marked for demoltion. I'll be following up on those in the next few weeks. A number of houses in Masten's Cold Springs neighborhood have been demolished in recent days. After languishing for more than a year, this burnout at 235 Woodlawn was sent to the landfill earlier this week. 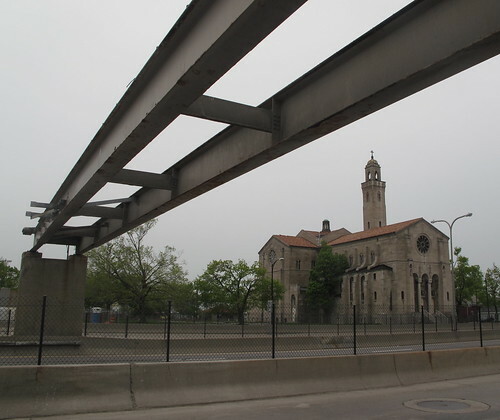 I wrote about 235 Woodlawn a few months ago - There is No Plan, Part II. The recent pattern of demolition activity suggests that there may be a strategy. 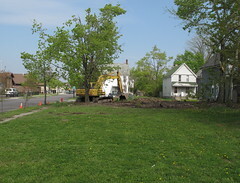 The four houses that were demolished this week were some of the neighborhood's worst - probably no chance for rehab - and were located in close proximity to Performing Arts High School and School #8 on East Utica, the temporary home of City Honors High School. Another truck with wrecker on board just turned the corner and pulled up down the street, right across from Performing Arts. Strategic and targeted demolitions are a welcome relief. I received a number of emails today from fixBuffalo readers informing me of the following award winning short video. Check out the official word from the Congress for the New Urbanism. The outstanding 3-minute video asks the question “What’s the greatest threat to our planet?” and shows how reimagining our cities and suburbs to be sustainable and walkable will cut carbon emissions, commutes and calories. "When it comes to saving the planet, what we build is the greatest threat…or the greatest hope," say the filmmakers in Built to Last. fixBuffalo readers may remember John Paget's video about the Queen City Farm project, right here. Connect with John Paget at Paget Films. Farm Report - Breaking Ground! This afternoon Buffalo's Common Council voted to approve what's considered a 'pilot project' and an agreement between the City and Mark and Janice Stevens. 27 vacant lots on Wilson Street - between Broadway and Sycamore - will become the largest 'urban farm' on this part of the planet. The Stevens bought a house last year on Fillmore Avenue. Their backyard opens on Wilson Street across the street from what is sure to become a transformative project for neighborhood and city residents. Amy Kedron, the founder and Executive Director of Buffalo First had this to say upon hearing the results of today's Common Council decision. Now Buffalo can join the ranks of the nation's most desirable cities that are distinguishing themselves by establishing highly sought after urban farms. More importantly this will strengthen our local food system. Mark told me that he was excited to begin work on 60 raised beds for this years growing season. If you're interested in dropping the Stevens a line or interested in knowing how you can land a hand, you can reach Mark and Janice here - woodmasstev@gmail.com. I'll be following this story as it develops in the weeks and months ahead. I walked around the City Honors construction site the other day and noticed that the natatorium is being enclosed. The foundation for the new all high gymnasium is beginning to take shape, too. A number of the BMHA residences surrounding City Honors are scheduled for demolition as part of the comprehensive site plan as seen here. 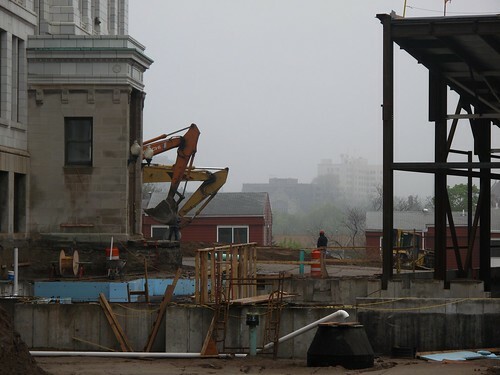 Work on the $40m reconstruction of City Honors is scheduled to be complete for the beginning of the 2010 school year. The Woodlawn Row Houses are still owned by the City of Buffalo and represent an amazing opportunity for the right individual. They're are located steps away from the recently renovated Buffalo Academy for the Visual and Performing Arts High School and a few short blocks from the Utica Station. After years of getting close to reaching a deal with various development teams, my March 2009 update outlined what I think may be the best development scenario for this project. If you're interested in taking a closer look at these, let me know. 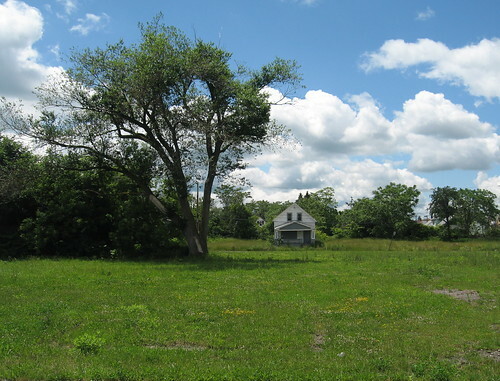 Michael Clarke, Executive Director of LISC-Buffalo, just sent along the following - Empty Neighborhoods Fill the Rustbelt - the latest AP story about the other housing crisis, the forgotten one. It's the crisis that remains after cities lose half their population and shrink before houses are eventually trucked off to landfills. The article appeared today in newspapers all over the country. Meet the forgotten housing crisis. While most attention has focused on the wave of foreclosures sweeping mostly middle-class, suburban Sunbelt neighborhoods from California to Florida, the nation's emptiest neighborhoods have remained concentrated in the same place for nearly a generation: the mostly minority, poor, urban neighborhoods of the American Rust Belt. Buffalo's story weaves its way through the article in a number of prominent parts. "I'd move in a heartbeat if I had somewhere to go right now," said Cindy Olejniczak of Buffalo, raking trash from the lawn of a boarded-up house to keep it from blowing in her yard. Roughly every third home in her neighborhood is vacant. Not even pizzerias will deliver to the area now. "It's almost like you wish they would just level the whole neighborhood," she said, "and start rebuilding again from scratch." 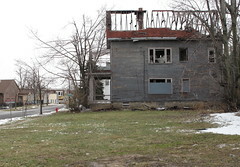 Buffalo News reporter Brian Meyer picked up the story this afternoon - Buffalo Has 6 of 10 Most Deserted Neighborhoods in the State. The AP analysis relies on US Postal Service and HUD data about emerging vacancy patterns. 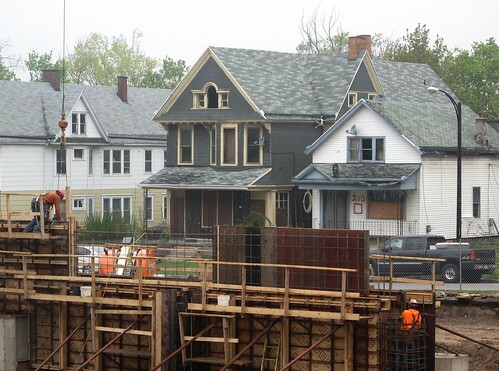 In Buffalo, LISC-Buffalo has been at the vanguard of analyis and public policy development around vacancy issues and urban land use development. Last year I posted this - Undeliverable & Unbelievable - Unstoppable? - that borrows heavily on LISC's distillation of this mountain of data in the US Postal Service/HUD mash-up. Anthony (Armstrong LISC-Buffalo Program Officer) advises that the AP only counted "vacant" not the "no stat" category, which means they vastly under-report the problem in chronically stressed tracts. Tract 27.02 reported at 30% vacant, but with no stats it would have been 37.6%, the worst of them, tract 28 has a combined "vacant" and "no stat" of 39.1%, but this only showed up as 27.6% in the AP tables. Today's short AP video - Empty Neighborhoods - shouldn't be missed. This conference maybe of some interest to fixBuffalo readers. In the wake of spiraling economic challenges, the ideology of community design should play a key role in an infusion of renewed hope and possibility for civic engagement, innovative planning and community building. We encourage everyone with a commitment to community design to join together this spring to share ideas and strategize about how we can function effectively and provide leadership for thoughtful and inclusive design of our built environment. Please save the dates June 4th through June 7th for the Association for Community Design's 2009 Conference when we will gather in Rochester, New York to focus on the role of community design through a series of discussions, workshops, site visits and tours that will help engage, focus and inspire our thoughts and actions. The anticipated demolition of the former Freddie's Donut site on Main Street near Michigan Avenue began this morning. See - Freddies's Going, Going... for additional information, links and a number of nostalgic comments about the sweetest spot on Main Street. I struggled through Mayor Brown's poor plan last night. Buffalo News columnist Donn Esmonde's redux appeared this morning - Brown Brings a Peashooter to Poverty War. The 77-page “Buffalo Poverty Reduction Blueprint” is so devoid of ideas, so lacking in imagination, that its totality of initiatives can be summed up in a sentence: Create a task force. Perhaps never in history has one document assembled such a quantity of eyeball- glazing, business-as-usual bureaucratic catchphrases: Promote small business. Strengthen the family. Encourage youth development. Improve school readiness. It is as if whoever wrote this thing got paid by the platitude. We do not need a position paper. We need a plan of attack. In the bigger picture, a document such as this begs the question of why this man wants to be mayor. If this is the best Brown can do, on so huge of an issue, he should step aside for someone who has some ideas. It is as if the house is on fire, and the guy in charge shows up with a bucket of water.